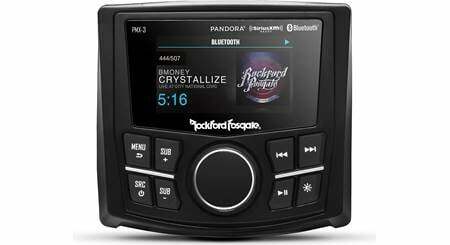 Rockford Fosgate's PMX-3 digital media receiver isn't just a receiver; it's kind of like a command center. Rockford Fosgate's PMX-3 digital media receiver isn't just a receiver; it's kind of like a command center. This all-weather powerhouse gives you a remarkable array of entertainment options in a compact package that fits into a standard 3" gauge opening. You can even connect a camera! The PMX-3 works with both Apple and Android phones, so you're ready to rock, no matter which type you prefer. Built-in Bluetooth (with Simple Secure Pairing) lets you stream your stored music and you can control your Pandora playlists (direct USB for Apple or Android via Bluetooth), too. Your phones and other devices will work nicely with the rear charging USB and rear AUX inputs. Now that you know all the ways you can play music with the PMX-3, you're probably wondering how it's going to sound. Pretty good, we'd say. The built-in amp pumps out plenty of power, and you can tune the sound to suit your tastes with the 7-band equalizer. With two full-range front channels and selectable rear/sub outputs, you can build a pretty nifty system around your PMX-3. And if you add a sub, the front panel control makes it easy to tune your bass. Piloting a boat or wheeling an ATV down a trail is busy work that demands your attention. That's why the PMX-3 is designed for ease of use. The buttons are easy to read and use, even with gloves on. The white, backlit controls are easy to see, day or night. And it's easy to activate an action or rear-view camera with the external trigger. 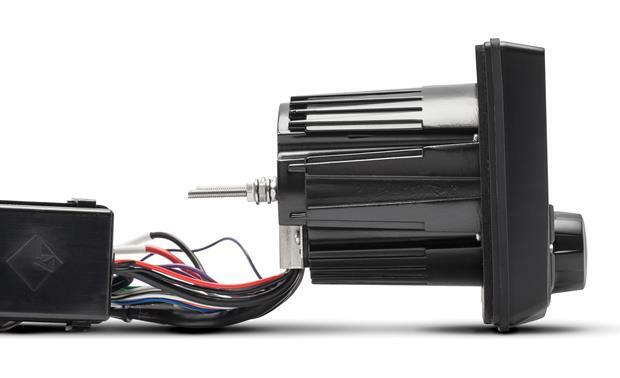 This receiver is designed for marine and off-road use, with an epoxy-coated circuit board and a durable front panel that's tough enough for pretty much anything you can get into. It's IPX6-rated for water intrusion, so even if you're hosing off your boat or ATV after a fun day in the outdoors, you won't have to worry about the receiver. Salt, fog, dust and sunlight won't hurt it, either, so get out there and enjoy yourself. iPod®/smartphone note: If you're going to use your iPod or smartphone with this receiver, be sure to check "Details" for compatibility information. Great Stereo. Just what I needed. can I add an amplifier to this unit? Yes, you can. RF has some very nice amps as well. 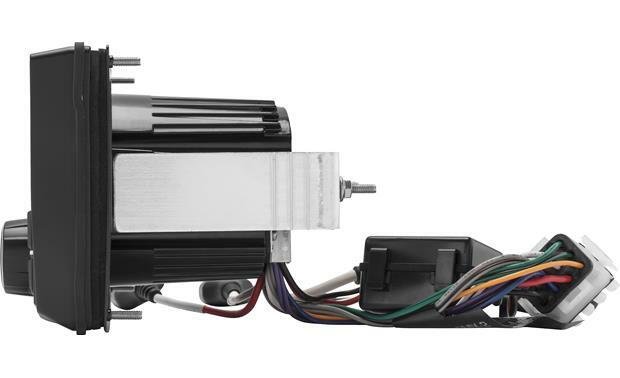 Marine Certified: Rockford Fosgate's PMX series of source units are fully tested against UV radiation degradation as well as tested to IPX water intrusion standards. They are also fully tested for ever changing environmental conditions such as temperature extremes, as well as vibration testing to make sure they can take a bump and keep performing. The PMX-3 is protected against Dust, UV, Temperature, Water, Corrosion & Vibration. Dust: The unit's display and motor structure are sealed up tight so they look as clear as possible and perform day in and day out no matter how many times you hit the trails. UV Inhibitor Materials: Centrex and ASA plastic materials are used for UV radiation resistance and components are tested in accordance with ASTM D4329 testing and certification procedures. Thermal Shock Tested: Tested for extreme temperature operation as well as severe fluctuations in ambient temperature. Components are taken to both low and high temperature extremes and then tested to ensure operational capabilities. Water Tested: IPX5 and IPX6 Ratings allow for the components to be directly sprayed with water without water incursion. Corrosion Protection: Two part epoxy coated PCB boards prevent corrosion of critical components due to exposure in moisture rich environments. Vibration: Subjected to full vibration and shock testing to ensure that it will take abuse and keep performing to our stringent standards. 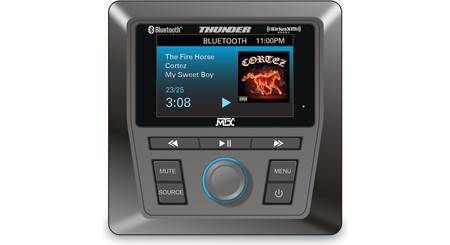 Applications: The PMX-3 digital media receiver is designed for marine and motorsports systems. 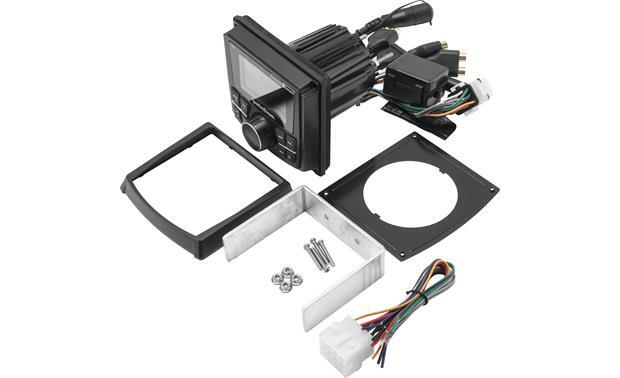 Optically Bonded LCD: The Rockford Fosgate PMX-3 features a 2.7" TFT color LCD for optimum viewing, even in full sun, that is optically wet bonded to prevent any dust or moisture penetration. There are two brightness settings for the LCD screen. Water Resistant Control Knob: The PMX-3 uses a water resistant rotary encoder knob, along with push-button controls that feature white LED illumination. Voltage Gauge & Warning: You can check the voltage of your system through the PMX-3's menu. The unit also provides a Low Voltage Warning Alert. EEPROM (Electrically Erasable Programmable Read-Only Memory): The Rockford Fosgate PMX-3 features an EEPROM memory system which retains settings even when power is removed. 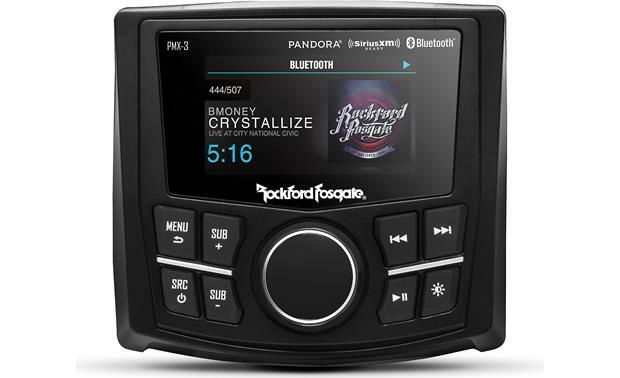 Bluetooth Music Streaming: The Rockford Fosgate PMX-3 offers built-in Bluetooth (version 3.0+EDR) for wireless music playback from your Bluetooth-enabled Apple iPod/iPhone/iPad, Android smartphone/tablet, Windows phone, Blackberry, and more. You are able to stream stored music and music apps from your Bluetooth device to the PMX-3 marine receiver. You can control basic playback functions like Play/Pause, Previous Next/Track and Repeat/Shuffle for stored music and music apps on your device. When using a Bluetooth AVRCP 1.4 compatible device like the Apple iPhone (iOS 5.0+) or an Android smartphone (OS 4.0+), you can even browse your stored music by category (Playlist/Artist/Song/Genre). The PMX-3 will also display your device's song/artist information with album art. Note: This unit does not support Bluetooth hands-free communication for phone calls. Optional Wired Remotes: The PMX-3 features a wired remote input which is compatible with Rockford Fosgate's PMX-1R & PMX-0R wired remote controllers (both sold separately). 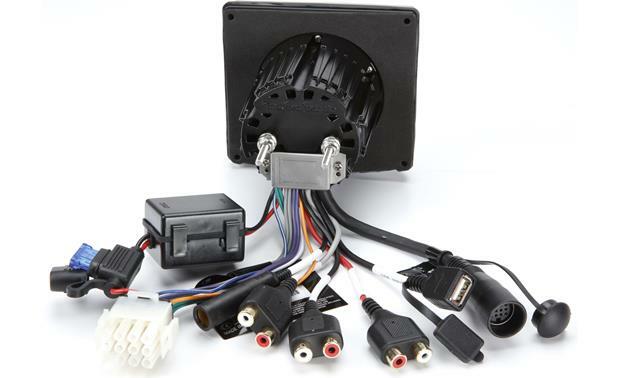 In most cases you will need one of Rockford Fosgate's extension cables (sold separately) to connect a wired remote controller. Up to 3 remotes can be added to one marine receiver using PMXYC Y-cable (sold separately). Camera Input: The PMX-3 features a composite video input for adding a backup camera (sold separately), so you can see what's behind your vehicle on the PMX-3's LCD monitor. 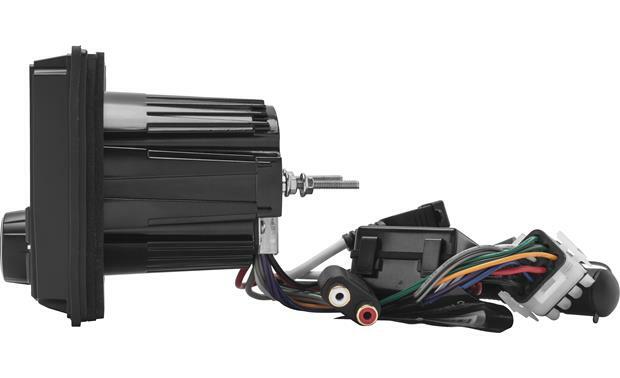 In addition, there is a Reverse Gear (purple/white) wire which connects to your vehicle's reverse lamp that will allow the marine receiver to automatically switch over to the display of the backup camera. USB Port: The Rockford Fosgate features a rear-panel USB (type-A) port for connection of a USB mass storage class device, like a USB thumbdrive or flashdrive. The unit supports playback of MP3 and WMA music files (999 folders/999 songs) loaded onto a USB MSC device (up to 32GB). You are able to browse your music by folders, as well as control basic playback functions like Play/Pause, Previous/Next Track and Repeat/Random. Note: The unit's USB port is not compatible with Android. iPod/iPhone Direct Connection: The Rockford Fosgate PMX-3's USB port can be used to connect your Lightning-connector or 30-pin dock connector iPod/iPhone to the head unit. Simply use the cable that came with your iPod/iPhone device or a 3rd party Apple certified cable (sold separately). The PMX-3 supports audio playback, music navigation, information display (including album art), and charging of your compatible Apple device. Music Control: The PMX-3 lets you navigate your Apple device's stored music by Playlist, Artist, Album, Song, Genre, Podcast, Composer, or Audiobook. The head unit also offers basic playback functions like Play/Pause, Previous/Next Track, and Random/Repeat. Newer Apple devices with iOS 6.0+ will remain unlocked while connected, so you can access music apps on your device. Older Apple device's clickwheels & touchscreens will lock when connected to the PMX-3. Song/Artist Info + Album Art: The head unit will display your iPod/iPhone's stored music file information; including Track number, Elapsed playing time, Song title, and Artist/Artist name. It will also display album art. Charging: The head unit's USB connection provides 1A of current to power and charge your connected iPod/iPhone when your vehicle's ignition switch is set to the 'ACC' or 'On' position (if your iPod/iPhone has no initial battery charge, then the unit will not recognize it). Aux Input: The Rockford Fosgate PMX-3 is fitted with a rear-panel stereo RCA AUX input to connect an external audio source. You can give the Aux input a custom name. AM/FM Tuner: The PMX-3 features a built-in AM/FM tuner with manual, seek, and preset tuning. You can store up to 18 FM and 12 AM preset stations; these presets can be stored manually or automatically. You can set the tuner to Local or Distance tuning. The Local option tunes to nearby radio stations with sufficiently strong signals for good reception. In areas where reception is poor, switching to Distance tuning enables the unit to tune in to more distant stations. You can choose between US or European tuning. 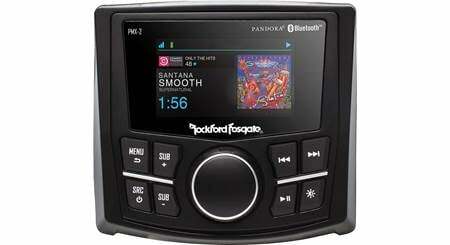 Weather Band: The Rockford Fosgate PMX-3 is also equipped with a built-in weather band tuner. Select from weather band frequencies between 162.40 to 162.55. Pandora Internet Radio: The free Pandora App (either from Apple's App Store or Google Play) lets you play music from the Pandora music service through the Rockford Fosgate PMX-3 using your USB-connected or Bluetooth-paired Apple iPhone (iOS 9.0+), or Bluetooth-paired Android smartphone. Your Apple iPhone must be connected to the PMX-3 via the appropriate the Dock-/Lightning-cable that came with your iPhone or via Bluetooth. Your Android smartphone must support A2DP/AVRCP/SPP Bluetooth profiles and be paired with the marine receiver. Your iPhone or Android smartphone will also need an active Data Plan account with connection to the Internet via 3G, EDGE, or WiFi. The PMX-3 provides control over the Pandora music service and displays Artist, Album, and Song information. New Station: Based on a currently playing track or artist, you can create a new station and save it to your Pandora account. Note: Access to these online service will depend on the availability of a cellular and/or WiFi network for purposes of allowing your iPhone or smartphone to connect to the Internet. Pandora is not supported in Canada and only available in the United States. SiriusXM-Ready: The Rockford Fosgate PMX-3 is SiriusXM-Ready and compatible with the SiriusXM Connect Vehicle Tuner (220SXV300 sold separately). The SiriusXM Connect Vehicle Tuner supports SiriusXM programming with access to 175+ SiriusXM channels via subscription; check out the most popular SiriusXM subscription packages here. MOSFET Amplifier: The PMX-3 is equipped with a MOSFET amplifier. Compared to conventional power supplies, the MOSFET amplification circuit is smaller and more efficient, and it delivers increased power with less distortion and absolutely zero on/off switching noise. More power means louder and cleaner music at higher volumes because you're not pushing the limits of the amplification circuit. Note: The power specifications for the marine receiver are compliant with the CEA2006 Mobile Amplifier Power Testing and Measurement standards from the Consumer Electronics Association (CEA). These standards were developed as a way to equitably compare power specs from model to model and between manufacturers. 4V/4Ch Preouts: The Rockford Fosgate PMX-3 is equipped with two pair of 4-volt preamp outputs (Front & Rear/Sub). You can configure the Rear/Sub pre-out for rear speakers with fading capability or as a non-fading sub output. You can turn off the unit's internal amplifier, you plan on using only external amps. Equalizer: The PMX-3 is equipped with a variety of EQ presets, and 7-Band EQ, and Rockford Fosgate's Punch EQ. Presets: Select between seven EQ presets - FLAT, ROCK, CLASSIC, ACOUSTIC, DANCE, ELECTRONIC, or HIP-HOP. 7-Band EQ: Use the built-in 7-band EQ to custom tailor the sound of your music to your liking. Punch EQ: Punch EQ is an onboard equalizer with up to +18dB at 45Hz and/or up to +12dB boost at 12.5kHz. High-Pass & Low-Pass Crossovers: The PMX-3 provides a high-pass crossover for the front & rear channels which can be set to 60Hz, 80Hz, 120Hz, or Full-Range. The unit also provides a low-pass crossover for the subwoofer output that can be set to 60Hz, 80Hz, 120Hz, or Full-Range. Sub Control: When the sub out is activated, you can independently adjust its volume level from 0 to 40. Source Gain: You can adjust the gain of each source so they all play at the same volume level. Select between -3dB, -2dB, -1dB, 0dB, +1dB, +2dB, or +3dB for each source. Key Beep: A beep tone will sound with any press of a button on the receiver. This can be turned on or off. Custom Mount: The Rockford Fosgate PMX-3 requires a round cutout in the bulkhead for inserting the chassis (will fit in a standard 3" gauge opening). Four machine screws and mounting bracket fasten the unit against the mounting surface, and hold the waterproof gasket and metal plate against the bulkhead. The included trim-ring hides the mounting screws for a neat installation. 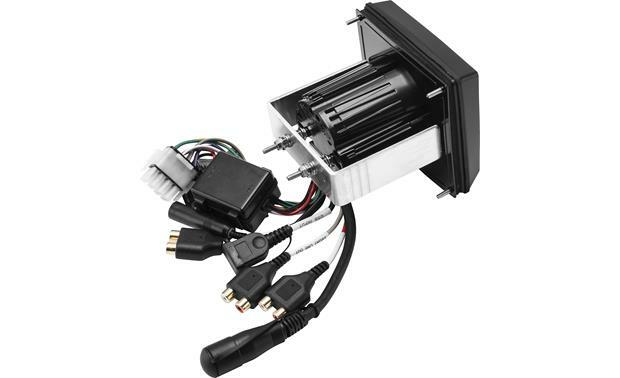 Note: The receiver does not include a mounting sleeve or ISO-mount screw holes to accommodate standard European or ISO-DIN automotive installation. Screw Hole Pattern: The faceplate has two mounting holes across the top of the face-plate, and two holes on the bottom of the faceplate for securing the unit to the bulkhead. The included trim-ring covers the screws holes for a neat installation. The screw hole spacing is as follows. Width (Top & Bottom): 3.995"
I have a 94 GMC 1500 with the small radio that most people replace with a pocket and put the receiver in the center. I don't. Mind fabricating a mount I've done fiberglass enclosures b4 but will this unit fit the stock receiver location? Is this unit compatible with IPHONE X? It has Bluetooth and a USB connection. Either one would connect to any phone. Of course. I'm not sure if you would be looking for a 2 or 4 channel to amplify your speakers or a mono block to power a subwoofer. It has the rca jacks in the back to power connect to a subwoofer amplifier. And has convenient controls on the front for the subwoofer output. 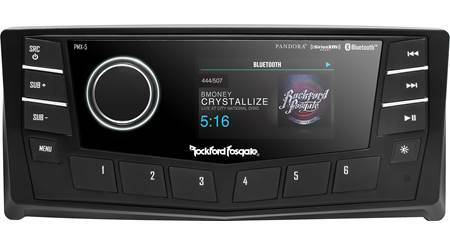 Searches related to the Rockford Fosgate PMX-3 Marine digital media receiver with Bluetooth® and camera input (does not play CDs).